The hit American animation Cars 3 sees Lighting McQueen try to regain his place in the sport that he loves - really really fast racing! 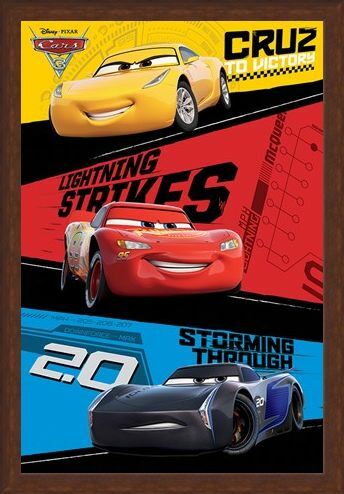 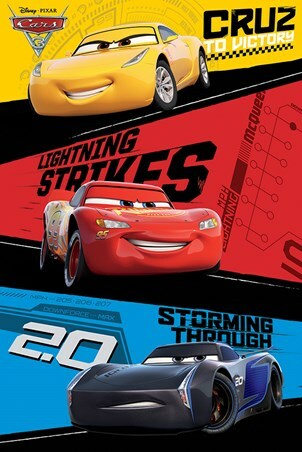 This tryptic poster features three engine's; high tech racer Jackson Storm (Armie Hammer) Lightning McQueen (Owen Wilson) and Cruz Ramirez (Cristela Alonzo) each flashing their slick wheels as they get ready for the next race, hang this colourful poster on your wall and get ready for a piston pumping time! High quality, framed Red, Blue & Yellow Trio, Cars 3 poster with a bespoke frame by our custom framing service.